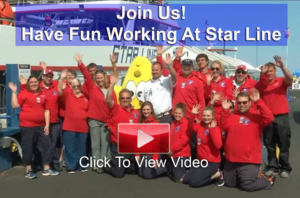 Below is a list of the current job opportunities available here at Star Line Hydro-Jet Mackinac Island Ferry. If you are a friendly, outgoing, and energetic person who loves to work with a great team of people, in and around water and boats, who also understands the importance of professional customer service, we welcome you to apply by clicking on the opportunities listed below. WE ARE CURRENTLY HIRING FOR ALL POSITIONS!! CLICK ON THE LINK BELOW AND FILL OUT OUR JOB APPLICATION. SEND YOUR COMPLETED APPLICATION ALONG WITH YOUR RESUME TO HR@MACKINACFERRY.COM. CLICK ON ANY OF THE JOB TITLES TO LEARN MORE ABOUT THE POSITION AND TO APPLY.